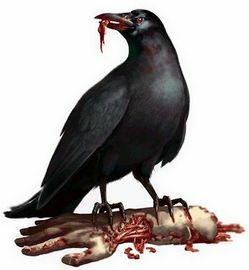 Raven eating a hand (in my case, the writer’s dead hand), March 19, 2017. (creativeuncut.stfi.re via http://pinterest.com). Six years ago, a student of mine made a reference that very much reminded me of, well, me, the person I was my senior year at Mount Vernon High School. It was as part of a conversation about looking for work. She didn’t want to be another starving artist, living in some basement apartment somewhere, “smearing paint on a canvas” while waiting for a big break. I thought at the time that the idea of a starving artist had all but died out in the era of bling-bling. But it made me think for a while about the choices I’ve made with my life and career in the years since the middle of my senior year at MVHS. I once said to my AP English teacher Rosemary Martino that I didn’t want to be a starving artist “like Edgar Allen Poe” all those years ago. Now a student had made a similar — although better developed — reference. I think I understood better the momentary look of shock on my former teacher’s face after that conversation. My student made me think about what Martino saw in my writing so many years ago. I certainly wasn’t focused on it. The same week she commented on making myself into a writer was also the week I had my Ivy League dilemma, between Columbia and the University of Pittsburgh for undergrad. I was waist-deep into my obsession with Phyllis, or really, my obsession with my crush on Phyllis. So much so that I wrote my creative writing assignment for Martino about me and my Crush #2, switching the names to “Donna” and “Phil” to barely cover up the truth of this otherwise short fictional work. Martino returned it without comment. She did comment heavily, though, on my assessment of Henrik Ibsen’s A Doll’s House, a series of redundant paragraphs in search for a coherent sentence. But my wack “The Way It Is” title was as much an indication that I was as far away from seeing myself as a writer as Earth is for Alpha Centauri without a faster-than-light-speed vehicle. And I was starving on so many levels back then. For food. For attention. For love. For a connection with anything or anyone who didn’t remind me of my poverty. Martino’s encouragement, though she obviously meant well, sent me scurrying in my mind for something a bit more comfortable than Poe’s indebted and untimely death. My own student’s commentary made me wonder if the quality of my life and career would be better these days if I had embraced the promise Martino saw in my writing back then. I mean, I was already a slightly malnourished six-foot-one and 160-pounder at that point anyway. The inner struggle to put thoughts to paper creatively would’ve been much easier at seventeen than it is as a married forty-seven year-old with a contrarian teenager and bills to pay. Maybe so. But until Noah or one of his progeny designs a time machine, I can’t rewrite my history in order to make me embrace what I now see as my calling. All I know is that those words I uttered in March ’87 have stayed with me for three decades. The question of finding and following my calling has always been juxtaposed with my need to eat and pay the rent and other bills. How do I do both without dropping one of the balls that I’m juggling? The issue for more than half of my adult life was finding my calling. Along the way, I spent the summer of ’88 unemployed, the first week of my sophomore year at Pitt homeless and three weeks in May ’91 losing sixteen pounds for lack of food. Not to mention six weeks of unemployment in ’93, walking to Carnegie Mellon many a time in the snow with holes in my sneakers in ’94, and two and a half years of underemployment from December ’96 to June ’99. I was a starving writer long before I saw myself foremost as one. In all, I’ve probably made about $2,500 in direct net income as an author and writer since 2003 (half through Fear of a “Black” America, the other half in the past two years), not counting consultancies or giving talks based on my writing. If I depended on my writing income, I maybe could pay the cable bill or treat us to a night of Cheesecake Factory and a movie. Two or three times a year. When one doesn’t follow their calling and doesn’t follow a typical path to making a buck, the tendency is insufficient funds. Creative abilities, even genius, may well drive people mad, but most folks in pursuit of their calling aren’t fools. No one, including the starving artist, wants to starve. Some of us, though, have a desire for much more than the ability to get a job, any job, and hold one long enough to see our own kids graduate from college and meet someone they truly love. Even with the responsibilities of adulthood, we shouldn’t give up on our own aspirations, for it’s those things that we reach for (although not at all costs) that will help others — including the most important folks — in our lives pursue their own calling.